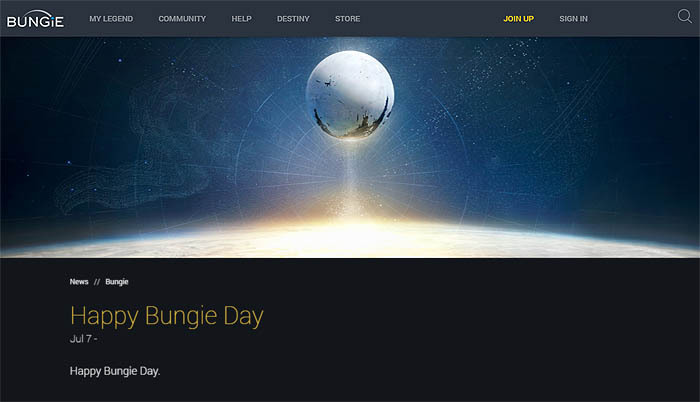 It's the 7th of July today and that means only one thing - it's Bungie Day 2016!! Keeping with tradition, Bungie have confirmed that every Destiny fan will get something special in return for their loyalty to one of Bungie's most successful games. We expect to see a brand new Year 2 Moments of Triumph, special rewards and limited time events to mark this special occasion. Those outside of the Bungie community will have absolutely no idea why the 7th of July is so special nor why the date was chosen in the first place. But any diehard Bungie fan will know that Bungie Day was created by those within the community, to celebrate the hard working people and the explosive pastimes that have brought them together. It's a day to celebrate your much loved pastime with a little gift from Bungie to say thanks. Moments of Triumph is a collection of individually difficult challenges that players must complete on their way to lighting up the entire Triumph circle. The original circle, with it's brightly coloured yellow placeholders, is shown in the image above. 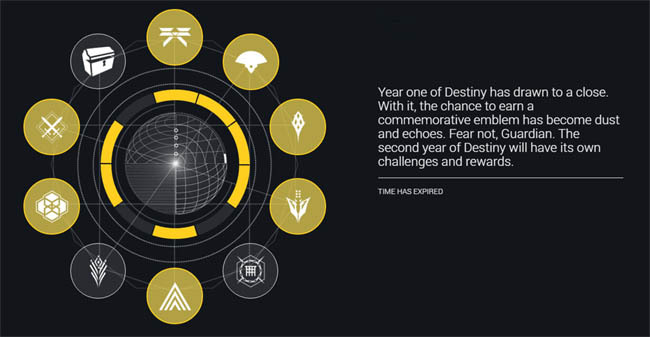 In Year 1, players had to complete a set of challenges that related to events and activities in that year. For example there was a challenge to "prevent the summoning of Crota's soul" and another for "defeating Atheon on hard difficulty". With Year 2 coming to an end soon it makes perfect sense for Bungie to release a Year 2 version of Moments of Triumph. 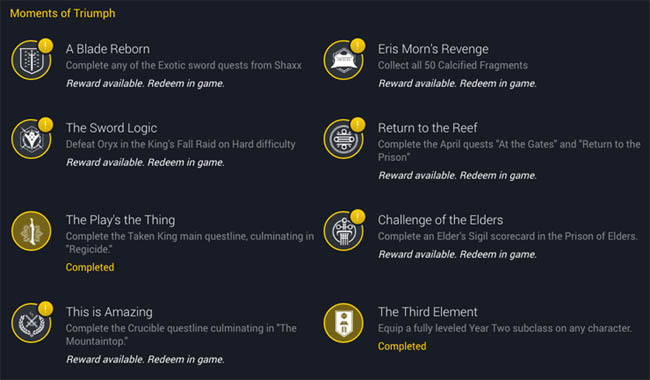 As before, players are expected to complete a set of challenges related to the content in Year 2. Some good examples being the Kings Fall Raid and the Sparrow Racing League. Completing the triumphs rewards players with unique emblems and shaders - something that very few players will be able to acquire without considerable skill and investment. You have until September 20th to complete all of your Year 2 challenges, at which point Year 2 ends and Rise of Iron takes over, aka Year 3. Any earned Emblems and Shaders stay in your inventory thereafter. 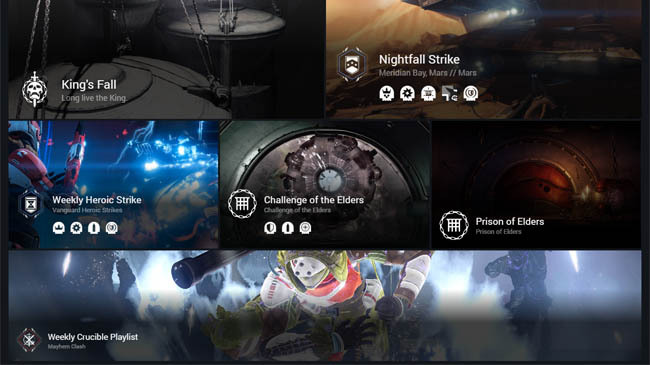 This is Amazing - Complete Crucible questline culminating in "The Mountaintop"
Return to the Reef - Complete April quests "At the Gates" and "Return to the Prison"
Simply login, click the TRIUMPHS tab at the top and then click the Year 2 Taken King tab to view the challenges associated with Year 2. Players can now collect a "Record Book" (from the Postmaster) to keep track of their Moments of Triumph. It's certainly alot easier than visiting the website every time you want to check on progress or to see what the next challenge might be. The Record Book also contains reward information, helping you understand which reward you're likely to get next. At this usually quiet time of the year, Bungie have been busy the past couple of weeks, working on new matchmaking settings for the Crucible in an attempt to improve the somewhat unpredictable matching that's currently in place. In particular, the time that it takes to matchmake is one of the highest priorities from this round of tweaking. Players who are at either end of the skill curve have the most to gain from these changes with the end result (hopefully!) being shorter matchmaking times. It's no co-incidence that Bungie have taken the time to make these changes just before the "Bungie Day" events are upon us. Rewind back to the summer of 2014 and we had the first mention of a Destiny related Bungie Day. 2014 was of course the launch year for Destiny - fans had just sampled the Beta test in all it's glory and were buzzing at the prospect of this new game. For obvious reasons there were no rewards at that time, but instead a compassionate statement which would lead up to the launch of the game which is now building up to it's conclusion. "This Bungie Day marks the beginning of the final leg of the journey that leads us all to the Tower. We've got some glimpses into the Beta test that will unite all of us in the wild. We've unveiled some of the first items of loot that you can add to your permanent collection." Come 2015 and Destiny was now in full swing. Both The Dark Below and House of Wolves DLC's were out and players were stashing away as many exotics as their limited Vault's space could muster. On this day, Bungie would reward players with an emblem and also launch their Armory feature on the website - allowing players to inspect stats for Destiny loot.